Fuqua Development is gearing up for Phase III of its nearby development, to include the now-abandoned Ford dealership on Scott Boulevard. The AJC reports the development will feature "a mix of restaurants/retail/apartments, possibly including senior affordable housing". Phase III site. modified from Google Maps. 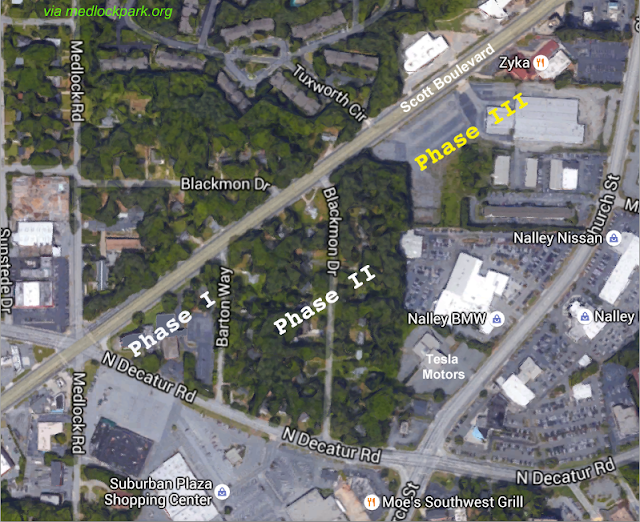 Fuqua Development will host a community meeting at 7 p.m. on January 6, 2016 at the North Decatur United Methodist Church (1523 Church St., Decatur). The AJC reports that Fuqua plans to file a land use plan the following day (January 7). Please see our posts relating to Phase I and Phase II of Fuqua's project, or click here for all posts about this evolving redevelopment.